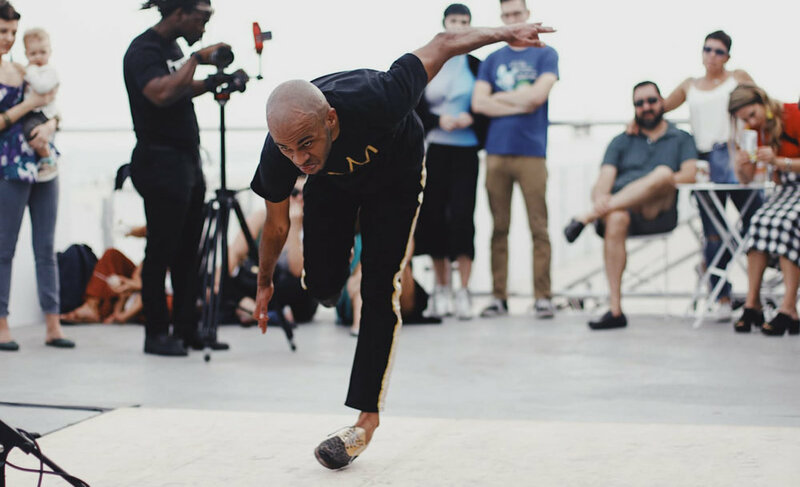 Cartier Williams Hoofer,Choreographer,Filmmaker and Performer who hails from Washington, D.C., began his tap dancing career at the age of four. Cartier learned his first tap steps from his grandmother Audrey Williams. At the age of six Cartier performed a piece choreographed by Mýa Cartier won Apollo Kids at The prestigious Apollo Theater Distinguished as one of The Apollo Theater's youngest "Apollo Legends". Later that year Cartier was invited to the Kennedy Center Honors along side Robert Downey Jr. Mr. Williams studied at The Washington School of Ballet under the tutelage of Mary Day. When he was 10 years old, Cartier Co-Starred with Tap Legends Buster Brown, Jimmy Slyde and Dianne Walker in the International tour of FOOTNOTES. Cartier consider it a blessing to have danced and shared the stage with tap pioneers and masters Peg Leg Bates, The Nicholas Brothers, and Gregory Hines. He has performed for 2 U.S. Presidents, and in 1998 Co-Starred in the PBS Special: In Performance at The White House with President Clinton. He toured the U.S. and Japan in the Tony Award Winning BRING IN 'da NOISE, BRING IN 'da FUNK, Co-starring with Savion Glover.He has performed at The Joyce Theatre, New York City Center as well as the L.A Kodak Theatre where he performed The AFI Awards: A Tribute to Tom Hanks. Other appearances include a performance at Usher's birthday bash in New York City performances for the FCC, The CIA, The State Department and Department of Justice. Cartier choreographed and directed CARTIER WILLIAMS RYTHM REFIX in May 2011 at Joe's Pub..Cartier Williams performed with Super-DJ Chew FU at The Palms Hotel/Resort in Las Vegas. Other credits include: National Tap Dance Day at MACYS, Chicago Sinfonetta Orchestra, Phildephia Pops, and New York City Pops Orchestra. In the fall of 2014 Cartier formed his new dance company The Cartier Williams Dance Theatre their credits include: New York Botancial Garderns, Childrens Museum of Manhattan, George Faison's Firehouse Theatre, Lebain New York, and featured in Black Coffee'smusic video Come With Me sponsored by Smirnorff. Cartier also perfomed at The Opening of the Cannes Film Festivel for Moulin Rouge. He is also a former student of The New York Film Academy. As a Filmmaker Cartier has written, directed and produced: Phone Bait, The Violinist, and My Love Awaits. He's appeared in Spike Lee's Film Bamboozled and in horror film Tales of Poe released in 2014 directed by Bart Mastronardi & Alan Rowe Kelly now avaiable now on iTunes. Now 27, Cartier is currently in production for his new show ZIGITYBOP! premiering at the Oslo Jazz Festivel and Zurich,Switzerland this summer.